Tech is big at NPC17. And, on Monday, the Tech Zone was packed with planners giving virtual reality tools a whirl, designing new transit systems (in a game app, at least), and checking out new planning technology startups. 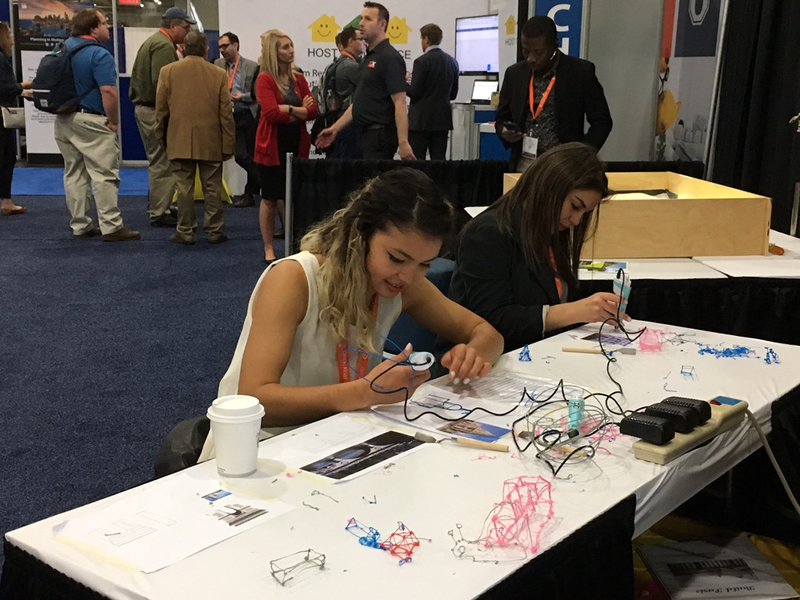 Students Mika Schweizer (left) and Francesca Sallinger from the University of Illinois at Urbana-Champaign “draw” models of famous buildings using 3D pens in the Tech Zone. Photo by Meghan Stromberg. Sidewalk Labs also hosted the Presentation Stage, where Tech Zone exhibitors demonstrated their products and services, and talked about the innovations they’re bringing to the planning community. Several other things were brand new this year. 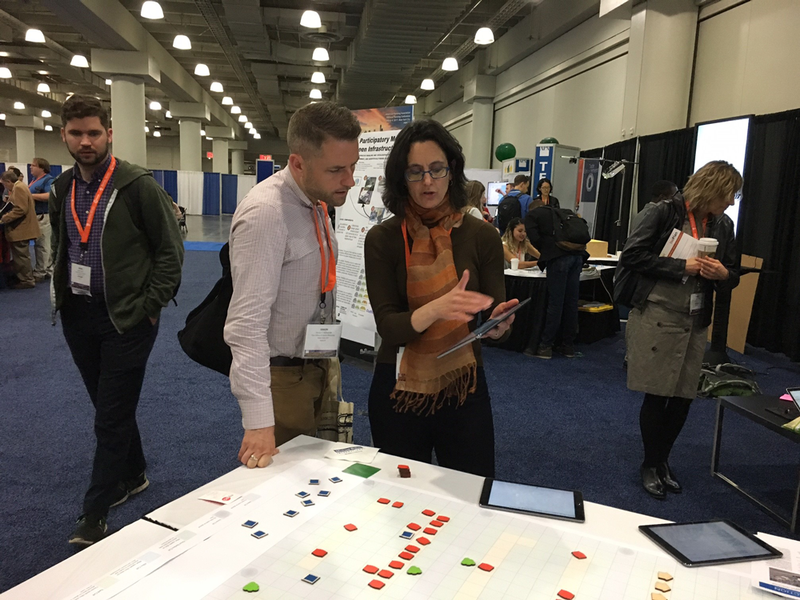 UIC researcher Moira Zellner shows Simon McDonnell from the Governor's Office of Recovery in New York her board game inspired by a program for green infrastructure planning that integrates scientific data and models with stakeholder concerns. Photo by Meghan Stromberg. Planners popping over to University Village got to see emerging from winners of APA’s new Academic Tech Innovators Grant, a competitive grant program that supports university-level planning technology research. Representatives from Ball State University’s College of Architecture and Planning presented their My Town app, a community inventory and analysis app. And researchers from the University of Illinois in Chicago’s College of Urban Planning debuted their participatory modeling program for Green Infrastructure Planning. Being a part of University Village “has been so wonderful,” said Moira Zellner. Modelur cofounders Ziga Bohm (left) and Jernej Vidmar (center) demonstrate their interactive zoning tool to Monica Tibbits-Nutt, AICP. Photo by Meghan Stromberg. Six startups showed off the latest planning technology at the Startup Station. One, Modelur, is an interactive zoning extension to Sketchup that allows users to drag a building across a digital zoning map to see how the structure would need to adapt to meet the zoning regulations there. A data jam is a workshop that uses data sets to solve specific challenges or answer questions. Data Jams, like hackathons, are becoming an increasingly popular and effective way to connect civic-minded tech experts with planning organizations and government agencies who need their help. 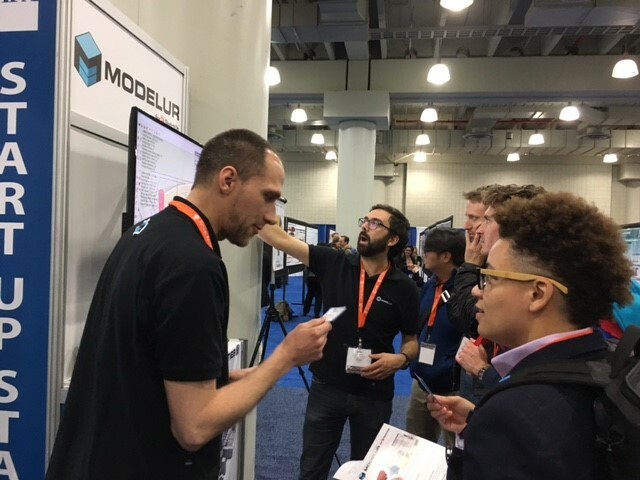 At NPC17 on Monday, APA partnered with New York City's Department of City Planning and Beta NYC — a civic organization dedicated to improving lives through civic design, technology, and data — to clean up and enhance the planning department’s newly launched Facilities Database, which identifies potential sites for co-locating facilities that serve similar populations. Top image: Participants in the Data Jam. Photo by Joe Szurszewski. Meghan Stromberg is APA's editor in chief.